As we are not allowed a Dad's Army this Saturday, here is something to puzzle over. It looks to be something to do with night vision, dark noise ............? 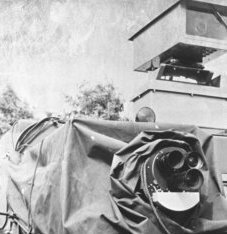 Yes it is lens, in fact several, not a turret & the covering could be a tilt of some sort, it was just something to hand I think just tied around whilst the project was undergoing trials. I don't think it is Richard as this is the 1950s & I can see nothing around that would provide an IR source. OK, earlier than I thought. This might give the game away. OK, it looks like a 15cwt truck possibly a Bedford MW with an infra red vision aparatus for the driver (it is in front of the driver's position), Cats Eye? Richard although there was such a kit & I do have the fitting instructions for it in a Bedford MW this not it & is not a night vision system just daylight. This larger view may help or maybe not. Damn speed cameras get everywhere! Yes you can't be too careful, they are out to get you! Maybe another view would help? Anything to do with the optical tracking of guided weapons? - I guess at a range if a camera is aligned to the sight ? Battlefield tv. Keep the higher ranks informed? TV guided weapons were in development if not use in the 1940's, so early target designator? Not GW nothing as sophisticated as that. That could well be an application for this interesting experiment. My assessment of date would be 1958-59. Yes Richard well done absolutely spot on! Any idea on the vehicle? There are a few clues in the first photo. The multi-lens camera is reminiscent of a BBC Sportsview camera of the 1950s & its position suggests it for the remote driver's benefit. Whilst the top camera looks to be rotatable & for a more generalised assessment of the area as Marvin the Martian suggested. Wow! It’s been quite a while since it got one correct!! Richard yes indeed it is. Yes the mirror arm was a good clue. As you will have observed this is a FV1609A which is the real & officially designated Humber, 1 Ton, Armoured, Mk 1 not to be confused with FV1611 etc that through ignorance assumed the label of "Mk 1". Often ignored is that many of these later Pigs have a cab contract plate that is correctly stamped Mk 2, which confuses some owners who realise their Pig was not up-armoured into what the Army incorrectly called a "Mk 2". Although this FV1609A has a hard top it is not the hard top of a FV1611, as this has a single pistol port at the sides. This single port each side is an indication of demountable armoured roof that was under consideration to role out with the FV1609A at the same time as introducing the FV1611 series. It was not found practicable & was discontinued. 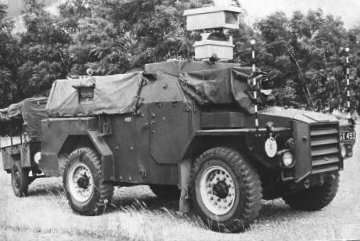 Apart from the RUC hard top conversions in 1960, the only other type of hard top around was one built not by FVRDE but the RAC Equipment Wing in 1957 as a replacement for the Halftrack as an ACV. It was found to be adequate but not ideal & the project was dropped in anticipation of the availability of the Saracen ACV. Anyway the RAC Humber hardtop had double side hatches that were quite large, so it is not this one. The trailer I assume is for generator to supply the additional electrical needs, as 25A from the dynamo isn't a lot of good. There are marker lights on the front wings & front & rear on the roof to warn pedestrians at Chertsey that the thing was on the move. I think the front width gauges are to help the operator as the wing edges would not be visible through the "Sportsview" camera. I suspect the steering column was controlled by a rack & pinion. I remember Dale Prior had a Champ with this on its steering column. The view of experts was that this was most likely a remnant of a remote control mechanism. I think there was a piece on it in the much lamented MV Magazine that was a super mag designed for & written by a collection of experts in their particular fields that was very hands-on for those who like working on their vehicles rather than just looking at pictures of pretty vehicles lined up at a show. Rather unlike the swish mags that are available now. I was wondering how they changed gear, but guess a low gear was selected manually before the remote took over and this was just an exercise to test the basics of remote control. I agree with you on MV Magazine, I still have all the back copies, good reference material in them and enjoyable reading (unlike the one in WH Smiths now). This MO only cropped up because of the remote control thread that was running reminded me of this Humber project was worth covering.